Parent-Child Interaction Therapy (PCIT) is an empirically supported, manualized intervention for addressing disruptive behaviors in young children (Eyberg. Child and Family Behavior Therapy 10:33–46, 1988; Neary and Eyberg. Infants and Young Children 14:53–67, 2002). Recently, researchers have expanded the use of PCIT with diverse populations to include children with autism spectrum disorder (ASD; Hansen & Shillingsburg. Child and Family Behavior Therapy 38:318–330, 2016). Adaptations to the original PCIT protocol may be needed to address core characteristics of ASD that otherwise may limit treatment effectiveness with this population. Characteristics of ASD that should be considered include deficits in social communication and interactions, high levels of rigidity and stereotypic behavior, and circumscribed interests and preferences. This chapter will discuss how the characteristics of ASD may pose challenges to the standard PCIT approach and provide detailed recommendations for several adaptations including altering the mastery criteria and adding preference assessments, stimulus-stimulus pairing, mand training, instructional fading, errorless prompting, and three-step prompting. 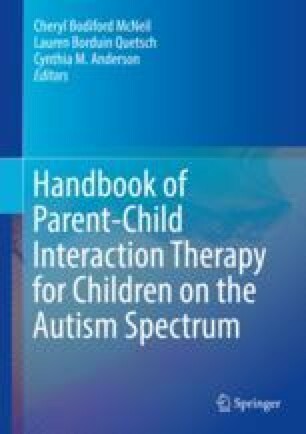 To provide guidance and suggestions to PCIT clinicians, the authors’ experiences working with parents of children with ASD in PCIT are discussed in addition to a case study (Hansen and Shillingsburg. Child and Family Behavior Therapy 38:318–330, 2016).